Repetitive stress also known as Cumulative Trauma Disorder (CTD) is the leading musculoskeletal injury problem in the workforce and general population. In fact, federal statistics show it has now even surpassed back pain. In general, CTD stems from overuse or repetitive motions that cause inflammation, pain, weakness, stiffness and decreased circulation. Carpal Tunnel Syndrome and tennis elbow (Lateral Epicondylitis/osis) are probably two of the most widespread examples that most people have heard of. CTD happens in situations where body tissues (muscles, bones, tendons, ligaments and nerves) undergo repetitive stresses over a period of time. Think typing, playing a musical instrument, playing sports, working on an assembly line, landscaping – just about anything where one does the same motions over and over again. There is even an equation that can predict if someone is susceptible to CTD by looking at the number of repetitions, the force of each repetition as a percent of one’s maximum muscle strength, the amplitude of each repetition, and the relaxation time between each repetition. This is called the Law of Repetitive Motion. This law allows an understanding of what happens to one’s tissues while undergoing a task. When injuries like this occur, muscles (and other tissues) become weak and tight. Those same tissues then begin to experience friction, pressure and tension which eventually undergo decreased circulation and eventual adhesions or fibrosis. This is the analogy to muscles, ropes and leather. Let’s take the muscles in your forearm for a minute. You are a blacksmith pounding on an anvil all day. Your forearm starts to get tired of all that pounding. Eventually the muscles become weak and tight. Over time those tissues begin to feel friction and pressure, and the muscles start to become stuck together taking on the consistency of ropes. If left unchecked, those ropy muscles start to stick together (adhesions/fibrosis) and eventually change from a ropy consistency to a more leathery feel. If you are experiencing problems like this the first thing you have to do is stop doing the thing that is making you worse. It’s not going to get better until you give it a chance to do so. The second thing is to get professional help. One of the best techniques I use for these types of injuries is called Active Release Technique (ART). In fact, due to its effectiveness and relative low cost, the Colorado Compensation Insurance Authority has financed a study to compare ART with other traditional forms of intervention. 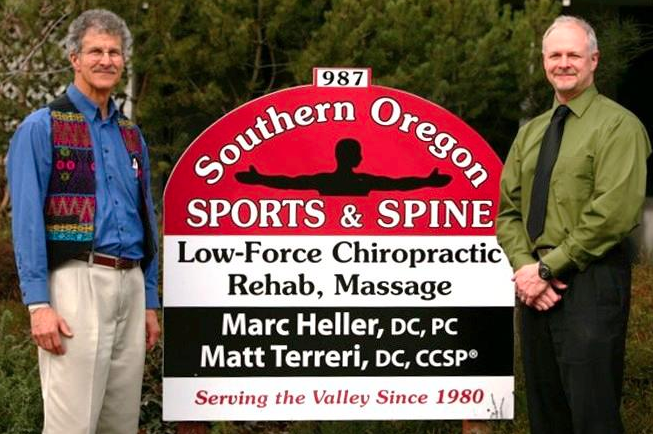 At Southern Oregon Sports & Spine we use a wide variety of tissue techniques to help dissolve your pain. If you have any questions about your pain or treatment possibilities please call me at the office. Also, check out www.activerelease.com for more info on this amazing technique.